When automobiles began being mass produced a century ago, the most common component used in their construction was steel. In the late 20th century, some automakers began incorporating fiberglass into their designs to make the vehicles more lightweight. And today, many luxury vehicles are turning to aluminum for use in many auto body exteriors. But this development changes the way that these cars and trucks are built — and repaired. 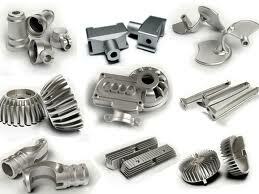 Though more expensive, aluminum offers many substantial advantages over steel. The most notable benefit is that aluminum components boast a weight of about a third of that found in their steel counterparts while maintaining comparable ratings in strength and durability. And a new treatment process used in the manufacture of automotive aluminum allows the adhesive bonds between the metal and other vehicle components to be more durable and longer-lasting. With U.S. automakers being pressured to double fuel economy standards by 2025, using lighter aluminum in the structural framework of the vehicles they produce can help them achieve that goal. This shift toward aluminum components will also have a profound effect on the auto repair business. That’s because fixing aluminum components requires a completely different process from that found in steel auto body repair. In other words, if your vehicle contains aluminum panels and parts, you can’t take it into just any auto repair shop that is only equipped to handle traditional steel-based vehicles. For starters, aluminum repairs must be conducted in a completely separate space from all other body work. 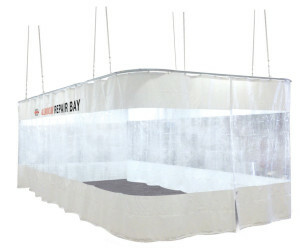 This so-called “clean room” must either be freestanding or quarantined from all other areas of an auto repair facility using a floor-to-ceiling plastic curtain. That’s because steel and other vehicle metals are made up of elements that contaminate aluminum. This means that iron oxide particulates that fly into the air during the grinding or sanding of steel components, and these corrosive substances will adhere to aluminum and result in paint failures and other problems. Also, when these steel-based contaminants interact with aluminum, it can cause a thermite reaction, leading to a possible explosion in the facility. In addition to building a clean room, an aluminum repair facility must also be furnished with specialized equipment to reliably carry out aluminum repairs. This starts with an entirely separate set of grinders, wrenches, and welding tools that are designed to work with aluminum components instead of steel. The clean room should also contain a gas evacuation system to remove as much of the harmful gases from the interior environment as possible. Finally, the facility can only be cleaned with an “explosion-proof” vacuum system to prevent dangerous thermite explosions during cleanup operations. The total cost of building and outfitting an aluminum clean room can approach $100,000. 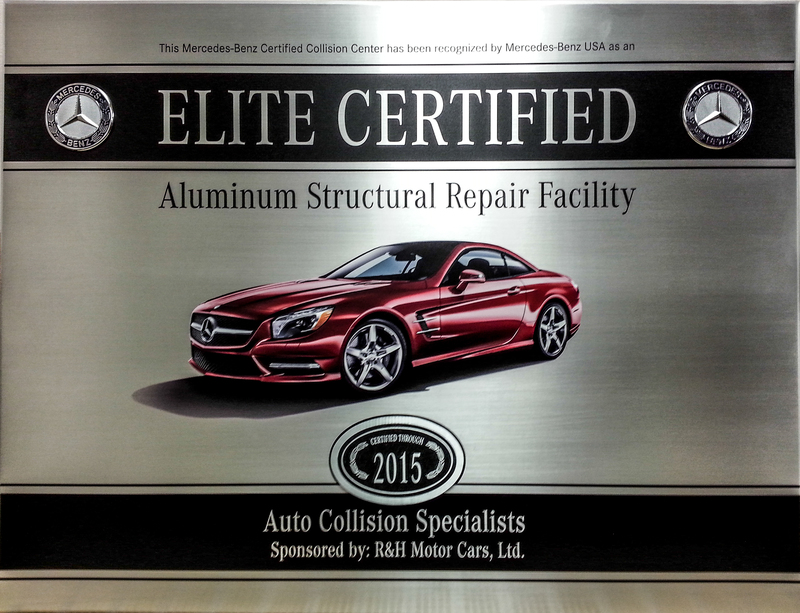 Auto Collision Specialists is home to a comprehensive aluminum automotive repair facility, including clean room, specialized tools, and all of the other equipment needed to repair any aluminum vehicle component. 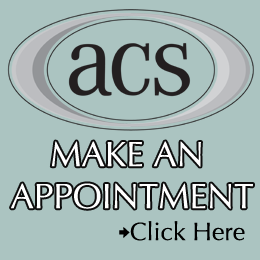 More importantly, the technicians at ACS have received the proper training to operate aluminum repair equipment and to make any type of aluminum repairs necessary. So if your luxury vehicle contains aluminum components, you get rest assured that the people of ACS know how to fix it and restore it to its like-new condition and appearance. Alcoa predicts that demand for aluminum in the automotive market will expand by 300% by 2015, and by tenfold by 2025. That means more vehicles with aluminum-based components on the roads throughout the Baltimore area in the coming years. This trend represents another reason why ACS is the preferred facility for auto repair of luxury cars, trucks, and SUVs in the region.